Johnston (nee Duggan) (Craigavon) December 4, 2018 peacefully at Rosemount Care Home. Martha (Marty), beloved wife of Jim and loving mother of Maria, John and James, a loving and much loved grandma of John, Conor, Emma, Sarah, Isaac and Ross, and dear sister of Elish, Saunders and Pat. Funeral from her home, 128 Drumgor Heights on Friday at 10.30am to St Anthony's Church for 11.00am Requiem Mass. Burial afterwards in St John's Cemetery, Lylo. Sacred Heart of Jesus I place all my trust in Thee. Deeply regretted by her sorrowing husband, sons, daughter, grandchildren, daughters-in-law Diane and Grainne, sisters, sisters-in-law, brother-in-law and entire family circle. 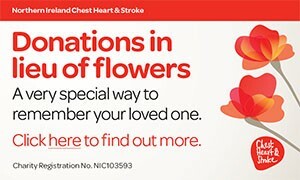 Family flowers only please, with donations in lieu if desired to, Macmillan Cancer Support, c/o McAlinden & Murtagh Funeral Directors, 5 William Street, Lurgan. Tel: 02838 324404. I am sorry to tell you that Martha (Marty) JOHNSTON has passed away.